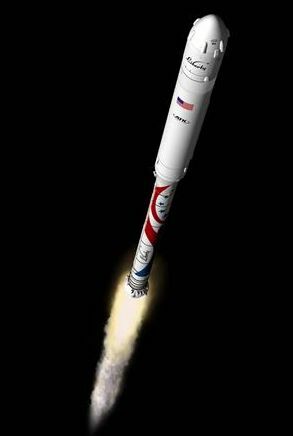 Early last year Alliant Techsystems (ATK) and EADS Astrium unveiled a new launch vehicle called Liberty, using a five-segment solid rocket booster built by ATK for the lower stage and a modified Ariane 5 core stage built by Astrium for the upper stage. The companies hoped to win funds from NASA’s second-round Commercial Crew Development (CCDev-2) competition, primarily as as an alternative to the Atlas 5 for vehicles being proposed by companies other than SpaceX (which, of course, is using its own Falcon 9). The companies didn’t win CCDev-2 funding but did get an unfunded Space Act Agreement to support continued study of the vehicle. In the meantime, though, the companies that did get CCDev-2 funding for their vehicles—Blue Origin, Boeing, Sierra Nevada Corporation, and SpaceX—all selected other vehicles for their spacecraft: SpaceX using its own Falcon 9, while the other three picking the Atlas 5. Liberty, it appeared, was left without a ride. Wednesday, though, in a briefing at the Spacecraft Technology Expo in Los Angeles, the companies announced their new plan: developing their own full-service crew transportation system, also called Liberty, using the previously-announced Liberty rocket and a crew capsule. That capsule is based on a composite crew capsule previously built by ATK for testing by NASA during Constellation. The vehicle’s service module is a slimmed-down version of the one bring developed for Orion by Lockheed Martin, while the crew escape system is the Max Launch Abort System (MLAS), developed originally as an alternative to Orion’s traditional escape tower system and successfully tested at NASA Wallops in 2009. ATK and Astrium officials, at the LA announcement, said that Liberty could be ready soon: initial test launches of the abort system would take place in 2014, with test flights of the full system in 2015, the second carrying a two-person test crew. “We have our first test crew picked out,” Kent Rominger, ATK vice president and program manager for Liberty, said, without divulging their names. Rominger emphasized the design safety of the Liberty system, calling it “the safest ever designed.” That assessment is based on what he described as a simple design as well as the demonstrated reliability of solid rocket motors and the Ariane 5 core stage (there have been nearly 50 consecutive successful Ariane 5 launches, going back nearly a decade.) Rominger said that the risk of a fatal accident on the shuttle was no better than 1 in 200, while the Liberty system would be better than 1 in 1,200. The companies confirmed they were seeking funding from NASA’s Commercial Crew Integrated Capabilities (CCiCap) competition, but didn’t disclose financial information, including the prices they planned to charge for their services (beyond that they would be cheaper than current Soyuz flight costs of over $60 million a seat.) Rominger said they would continue development of Liberty if they don’t receive CCiCap funding, but at a slower pace than the schedule they described that called for an initial crewed flight in 2015. “There’s no way I can meet a schedule like that without an award from NASA,” he said. If the market turns out to be just ISS then there will only be room for 2 or 3 commercial crew providers for the 7 or 8 crew and cargo launches a year. But if Bigelow puts up one BA330 then the number of flights required doubles to 14 to 16 a year and all 5 vehicles, Dragon, CST-100, DreamChaser, Blue Origin and Liberty may find markets carrying either crew or cargo. The one most likely to miss out is Orbital as their Cygnus only provides cargo up mass, no down mass and no crew.